Max Bianconcini new step-up world record: 11,5 meters! FMX goes mainstream in Italy! Dear FMX World's friends, I'm back after a long time with a fresh news from italians FMX scene! 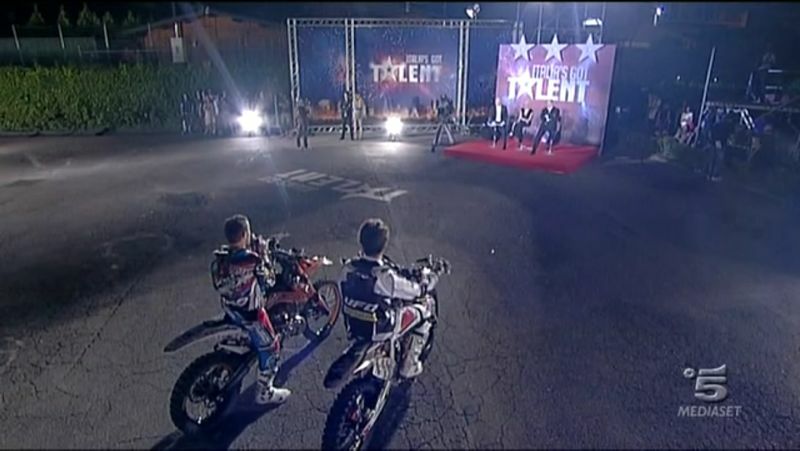 Some weeks ago Vanni Oddera and Massimo Bianconcini took FMX for the first time in Italy to a talent show: Italia's got talent, broadcasted on Canale 5, one of the most watched TV channels in Italy. Today I'd like to share with you an interesting solidarity project that's being carried on by italian FMX rider Vanni Oddera. Get in touch with the Red Bull X-fighters judges! Red Bull X-Fighters Italy: all roads lead to Rome, again! In less than 5 days, the X-Fighters will reach the "caput mundi" for the italian stop of the Red Bull X-fighters tour 2011. Are you ready to rock the eternal city once again? Last saturday italian's freestyler Vanni Oddera unveiled his brand new 2011 KTM piece of art. Very cool photos Marco, great job!! Congrats!! Thank you very much!! Glad you noticed that it's my b-day in your rush!! Hope you and all your family is super fine!! Hope to meet you sooner than X-F will come back to Rome!! Hey Marco! I'm doing good thank you. It's great to hear that you had a great time there! I can imagine it was a blast! Especially with the new record set. And don't worry about the pictures, the ones you did are amazing! Sometimes even the pro photographers need to have fun and go to events as spectators ;) I'm happy you enjoyed it! Wish you a great weekend! Very cool photos Marco! Very nice job really! Hello, hello budy!!!! Superhappy B-day to you!!!! Have lots of fun and presents!!!!!!! !